In the Perth area, there are a number of farms and agricultural centres, wherein sheds are used as storage areas for necessary machinery, equipment, animals and produce. One of the most common items that you will find in a farm shed is hay. Hay storage may sound simple but there are different things you need to consider to ensure that the hay for your farm animals will not go to waste. Covered and enclosed sheds are popular places to keep hay and indoor storage is generally the preferred option. However, there are few things to keep in mind. First, make sure that your hay is kept from certain elements, such as rain and pests while maintaining good ventilation. Another thing you should keep in mind is that hay is highly flammable and therefore has a high risk of catching fire if proper safety procedures are not followed. If you don’t plan on having a separate shed for the hay, store just small amounts of hay in the barn and refill as needed. Also, make sure to keep the said dried grass away from your equipment, machinery, trucks, gasoline and other items that can cause fire. Another popular means of hay storage is to keep the hay under just a roof or a shed with no walls essentially. This may suffice but you should put a tarp over the hay to protect it from moisture and extreme weather conditions. Sunlight is also counterproductive as it robs the hay of nutrients, so keep it out of direct sunlight. In addition, try not to keep your hay stored outside for very long because it will eventually spoil depending on the severity of the weather. On any farm, it is important to make sure that hay is stored properly since it has such an important role. For indoors, keep the hay dry and well-ventilated and away from anything that could start a fire. Outdoors, keep sunlight away from the hay and try to not keep it out there for too long to avoid spoilage. 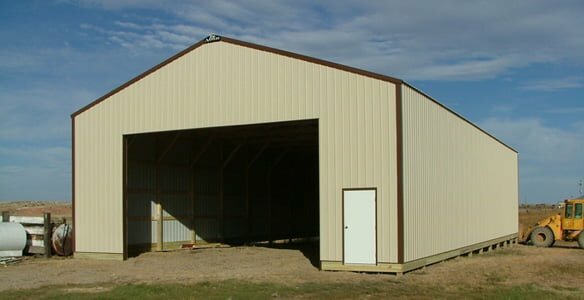 For more information on how we can build you the best hay storage sheds and barns in Perth, please call 1300 778 628.